If you think you’ve had good fish in your life, wait till you go to Oceanique. Because a recent visit for a tasting there changed entirely my ‘pescetarian’ life! For those of you who don’t know about this Evanston gem, Oceanique is a French-American seafood restaurant upholding the utmost standards of sustainability while serving high quality fish. Basically everything I love about life. Oh and they have a 750 wine list too! My guest and I walked into an eclectic space and were seated at a nice, cozy table and immediately started off with a glass of the Villa Russiz 2015. How perfect! Our very first dish was the Wild Japanese Day Boat Scallop Sashimi with watercress, yuzu and dragonfruit. Have you even heard that combination before? I immediately knew that this was going to be a tasting of some of the most creative dishes I’ve had in my life. Chef Mark Grosz came out shortly after to say hello. 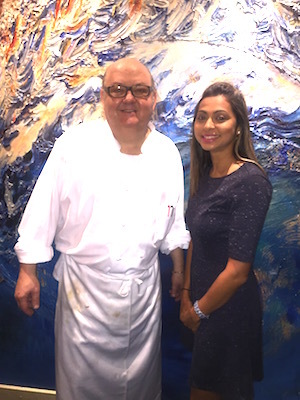 Having acclaims such as tutelage under Jean Banchet and experience at the renowned Le Francais, I had no doubt that we were going to be blown away by his culinary prowess. The second dish that arrived was the Scallops and it paired beautifully with the Kumeu Village Chardonnay. A reminder of how much good wine can augment a dish. 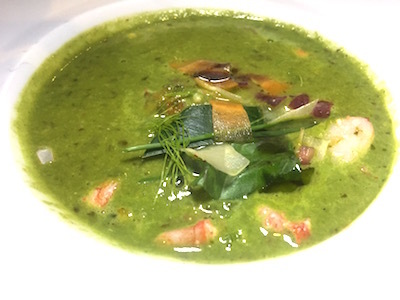 The Corn Leek Soup in burnoise was mind-blowing with fresh pieces of lobster and orange cauliflower strewn in. My usual tendency is to pick the meat out first, so it’s a good sign that I didn’t feel the need to do that here, because I loved the stock as much as the meat. Bouillabaisse is the non-negotiable French classic for me at any French restaurant and quite frankly, the benchmark. Chef was kind enough to send out a Strawberry Sorbet to help clean our pallets before he sent out what he knew was the dish I’d almost been panting for. 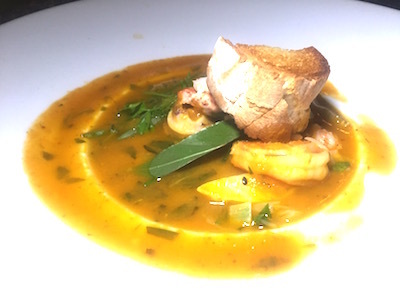 Out came a piping hot bowl of the Bouillabaisse Oceanique, which had lobster, trout, skate, shrimp, scallops, cod and squid in a sublime tomato broth with a saffron aioli on the side. I’ve had many versions of this Provencal fish stew and I think the flavors here were one of my favorite! 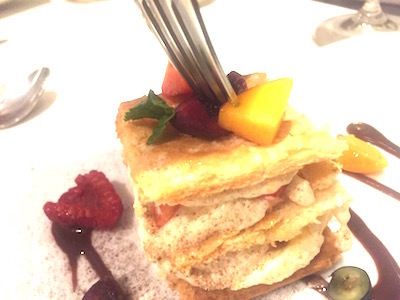 The house-made Napolean for dessert sealed the meal perfectly. Three layers of puff pastry neatly bound with vanilla mousseline inside and berries valrhona chocolate sauce showered over. As full as I was, that is the type of dessert you just make room for. I felt that every aspect of this dinner and every bite of the food left an unforgettable mark for me. Chef Grosz is a genius and despite a very lavish meal, it left me wanting more, so I will have to return soon.